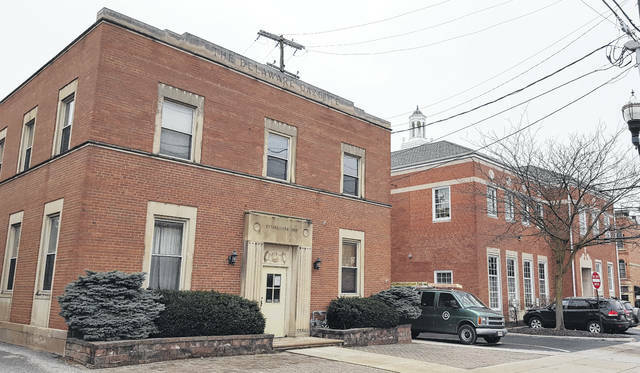 A lease agreement between the City of Delaware and a Worthington-based co-working space provider involving the City Hall Annex building (former Delaware Gazette building), left, is expected to be voted on by City Council on Feb. 12. The city has expressed plans to construct a connector bridge from the second story of the City Hall Annex, 18 E. William St., to City Hall, right, allowing city employees to utilize both facilities. A pending lease agreement between the City of Delaware and a Worthington-based co-working space provider is poised to breathe new life into the former Delaware Gazette building at 18 E. William St.
On Monday, city council heard the first reading of an ordinance authorizing City Manager R. Thomas Homan to enter into a lease agreement with COhatch (doing business as Delaware Community Space LLC) for a high-end co-working space in the city-owned downtown building now referred to as the City Hall Annex. Homan said the agreement, which could be approved following a second reading during council’s Feb. 12 meeting, has involved a lot of discussion over the past year between the city and COhatch founder Matthew Davis. Under the agreement, which Davis said he is ready to sign once council signs off, COhatch would agree to a 10-year lease with the right to two additional five-year terms for use of the basement and first floor of the City Hall Annex (9,386 square feet of space) at a monthly rate of $6,500 ($78,000 annually). Davis said once the co-working space is ready for move-in, the business will have anywhere from 35 to 40 offices for small businesses, etc., and will offer the public the opportunity to use the facility by purchasing a social membership. “We think it’s a great use of the space, and we look forward to hopefully getting past this phase and onto the next one — building something,” Davis added. According to a memorandum sent to council by Homan, under the proposed agreement, the city would be responsible for bringing the first floor and basement to a “vanilla box” state up to a negotiated maximum cost to the city of $1,185,686. The memorandum goes on to state the city’s cost to finance the renovation would be $111,876 annually over a 15-year period, but by receiving $78,000 annually in rent, the gap between renovation costs (financing included) and rent would be approximately $33,876 annually. Economic Development Director Sean Hughes added once the city has completed the renovations of the basement and first floor, Davis will be able to do his own work to bring the space to a “branded state” that will allow him to run his business. “(It’s) a way for us to work together to renovate this building in such a way it makes it usable and presentable to them and their customers, but also allows us in the future to be able to utilize the second floor of the building for future office space for the city,” Hughes said. In order for the city to be able to use the second floor in the future, Homan noted the plan is to build a connector bridge between City Hall and the top floor of the City Hall Annex. Homan states in his memorandum to council that municipal impact fees could be used to connect the buildings, which has an estimated price tag of $275,000.